Outwit your opponents in this game that puts a new twist on trivia. Asking players to think twice, this game is a hilarious twist on trivia and a groan-worthy contest for pun lovers. Every question has a trick up its sleeve, and it's a race against the other team to second-guess it. The game is packed with 400 sneak-attack brainteasers, like "What building has the most stories?" Answer: a library, of course! Two teams take turns posing confounding questions to earn tiles and test who has the quickest wit - the first team to gather 10 tiles wins. As if the questions weren't delightfully maddening enough, Trick Question also features two "Trickster Totems." Grab the "Us!" totem if your team knows the answer, or snag the "Them!" totem to put the other side in the hot seat so they have to answer. It even has special rules for three players, where it's every clever person for him or herself! Made in China. 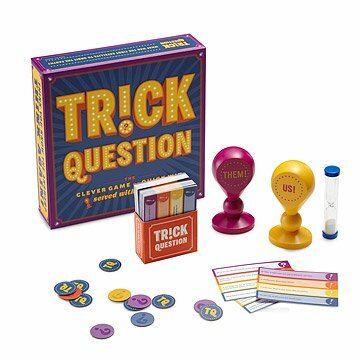 Superb collection of trick questions all in one place! Bought this for my family for Christmas. It was pretty fun as we like these types of games. I purchased this for my husband. We still haven't actually played the game, but he was reading the cards to all of us and we all were trying to answer the questions. Lots of fun. Hopefully we'll get to actually play it soon! I WANT to buy this again! I'm sorry I wasn't there when they opened it! I'm sure it's a great game, just from what I read on the box before I sent it to them. We still haven't played the game, but have read the questions. It's fun! I may order again since my dog did a little gift unwrapping and chewing. It's that good. I was looking for a game for family game night that my son would enjoy. He's getting older and is starting to outgrow some of our standard favorites. This was PERFECT!